Hell isn’t very popular in our day. Oh, sure, the word gets used a lot, but not in the sense of a place of eternal torment. In fact, many are denying the existence of hell completely. Others say it exists but is only temporary. These may sound like nice ideas – after all, who would truly wish an eternal lake of fire on anyone? But our wishes and opinions don’t determine whether or not hell is real. It is only the Bible, God’s Word, that can tell us the facts about hell. So let’s briefly consider just a few passages of Scripture that address the subject. Warning: these are not “nice” verses – but they are the very words of God from the Bible. Hell is real, not because we want it to be, but because the Bible is very clear on the subject. In fact, Jesus spoke about hell more than anyone else. He even spoke more about hell than He did about heaven. Hell is not a place where you party with all your friends, except without air conditioning. 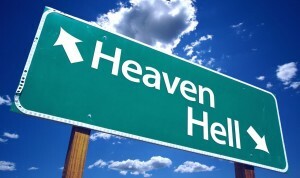 Hell is the place of eternal torment for all who don’t turn to Jesus Christ for salvation. Does that concern you? It certainly should! The good news is that you can avoid the eternal flames of hell. Just as hell is real, so heaven is real, and God has made a way by which we can find complete forgiveness of sins and be made perfectly righteous before God, allowing us to have assurance of heaven. We implore you — take a bit of time, ask God to give you a soft heart, and consider your eternal destiny! Please see our other pages (links above) for details on how to find salvation and have a right relationship with your Creator. Beware of manufacturing a God of your own: a God who is all mercy, but not just; a God who is all love, but not holy; a God who has a heaven for everybody, but a hell for none; a God who can allow good and bad to be side by side in time, but will make no distinction between good and broad in eternity. Such a God is an idol of your own, as truly an idol as any snake or crocodile in an Egyptian temple. The hands of your own fancy and sentimentality have made him. He is not the God of the Bible, and beside the God of the Bible, there is no God at all. – JC Ryle, in Fire. Fire! What would you say of the man who saw his neighbor’s house in danger of being burned down, and never raised the cry of “fire?” What ought to be said of us as ministers if we call ourselves watchmen for souls, and yet see fires of hell raging in distance, and never give the alarm? Call it bad taste, if you like, to speak of hell. Call it charity to make things pleasant, and speak of smoothly, and soothe men with constant lullaby of peace. I have not read my Bible. My notion of charity is to warn men plainly of danger. My notion of taste in the ministerial office is to declare all the counsel of God. – JC Ryle, in Fire. Fire! "What! Get to heaven on your own strength? Why, you might as well try to climb to the moon on a rope of sand!"